“a Lamp to my feet. a Light for my path.” – Revelation 12:1,5a; John 19:27 | A LAMP TO MY FEET. A LIGHT FOR MY PATH. Then a great and mysterious sight appeared in the sky. and who had the moon under her feet and a crown of twelve stars on her head. Then she gave birth to a son, who will rule over all nations with an iron rod. From that time the disciple took her to live in his home. Have I taken Mary, the Mother Of God, into my home…to be my mother? God the Holy Spirit, Holy Trinity, one God, have mercy on us. Mother immaculate, pray for us. Let us pray. Grant, we beseech you, O Lord God, that we, your servants, may enjoy perpetual health of mind and body; and by the intercession of the Blessed Mary, ever Virgin, may be delivered from present sorrow, and obtain eternal joy. Through Christ our Lord. Amen. NOTE. 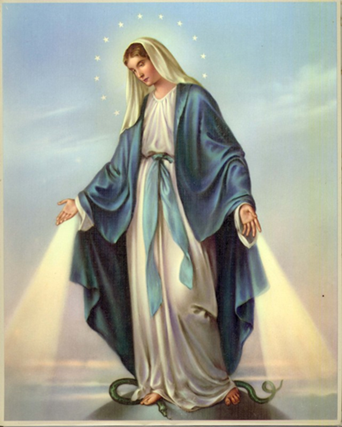 Today, the 27th of November 2017 marks the 187th anniversary of the Medal of the Immaculate Conception, popularly known by Catholics the world over as the Miraculous Medal.